This is truly the most amazing paint we have ever seen. Completely invisible until you shine a blacklight on it! Safe for hair, body, clothing, and nearly any surface! The Brush-on version is perfect for creating detailed designs or using with an air-brush system! CLICK THE IMAGE to read more and see lots of pics of this paint in use!!! ClearNeon will blow you away! This completely invisible clear coat paint can be applied to almost any surface and even people. Totally transparent until you shine a UV or blacklight on it, then watch the paint glow so brilliantly it will astound you! Use ClearNeon Brush-On by itself or in addition to the Aerosol to create detailed designs. ClearNeon Brush-On can also be used in an air-brush system by diluting in a 50/50 mixture of paint and water! Since ClearNeon is invisible without UV light, you can even paint over existing signage or artwork without damage to simply accent or totally alter the appearance. We watched with amazement a demonstration where a replica painting of the Mona Lisa looked totally normal hanging in a room until the UV light was turned on, then a ghastly shockingly bright skull appeared instead of Mona's face. Imagine the possibilities! With regular "glow" paint, the painted surface simply glows in the dark and is not hidden, while this paint is totally invisible even in darkness until you shine UV light on it. Surprise the "daylights" out of onlookers when you reveal your artistic creation seemingly out of nowhere. Turn normal white walls in a boring office into a freaky vibrant mural no one will know is there until you choose! 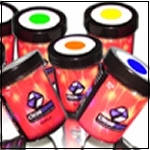 Safe and non-toxic, ClearNeon works great on clothes, skin and hair for the ultimate versatile costuming effect. ClearNeon has everyday uses too! Tag your stuff: use on tools, toys, CDs, and gear and prove its yours. Spray on computer equipment and circuit boards and watch the high-tech glow! Create games like tic-tac-toe or hopscotch grids that you don't need to erase during the day. Please note that ClearNeon aerosols will NOT work under LED blacklights, and work only under multi-spectrum blacklights (like fluorescent blacklight tubes). 1) Colors can be layered to produce millions of color possibilities. Remember that you are working with light and not pigments, so you might not get the color that you expect. Practice a little first. 2) ClearNeon reacts to the UV "A" specific light. UV "A" is safe and harmless to humans, and is not hazardous to the environment. It is used to steralize and will kill many cold and flu viruses, along with bacteria that can make humans sick. 3) ClearNeon is transparent "see through" but like "clear coat lacquer" it has a slight shine to it. It will blend in with almost every type of surface and may appear slightly shiny when applied to flat wall paint, but otherwise there is no noticeable color to ClearNeon. 4) ClearNeon does not rub off of skin or clothes and stays on until you shower or use laundry soap. 5) ClearNeon can be applied to nearly any material or surface except: SOME clear glass may not work if made with UV-blocker which does not allow ClearNeon to glow. It may also make some clear glass or acrylic appear cloudy after application. ClearNeon also does not work great on White Cotton unless you use the ClearNeon Black Eraser product, because that material will also turn bright under blacklight. 6) ClearNeon-painted surfaces should be kept out of direct sunlight as it may cause ClearNeon to eventually fade. 7) ClearNeon is very durable and will not come off if it gets wet or even soap and water soaked. The aerosol only comes off with ammonia, or an ammonia cleaner like Windex. The Brush-On is permanent polyeurathane and will not come off. ClearNeon retains its effect for years and lasts as long as any normal household paint. 9) Please note that screw-on household "blacklights" (the kind that look like normal light bulbs) do not produce real UV light and do not work with ClearNeon. ClearNeon does not work under LED blacklights. We suggest using fluorescent blacklight tubes for the best effect. 10) If sprayed on solid, a single can of Aerosol ClearNeon will cover approx. 48 square feet, or a 1 inch wide line 600 feet long. The Brush-On covers about the same area per can. ClearNeon Brush-On is available in Blue, Green, Red, and Yellow. Each container is 4 oz.